Lately I’ve been thinking about how much plastic we use and discard on a regular basis. My husband drinks a lot of soda so we easily toss two 2-liter soda bottles each day. There’s also shampoo bottles and glass food jars and giant dog food bags and just…sooo much plastic. 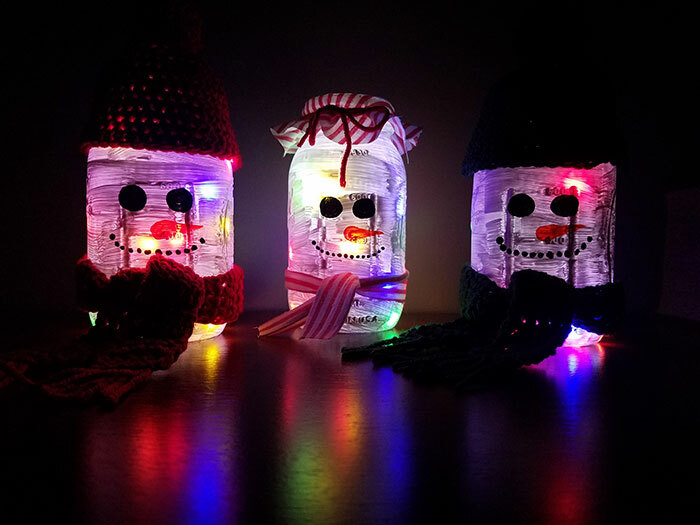 Recycling is great, but what if we made a better effort to keep plastic out of the waste cycle and instead turned it into functional objects or maybe even art? 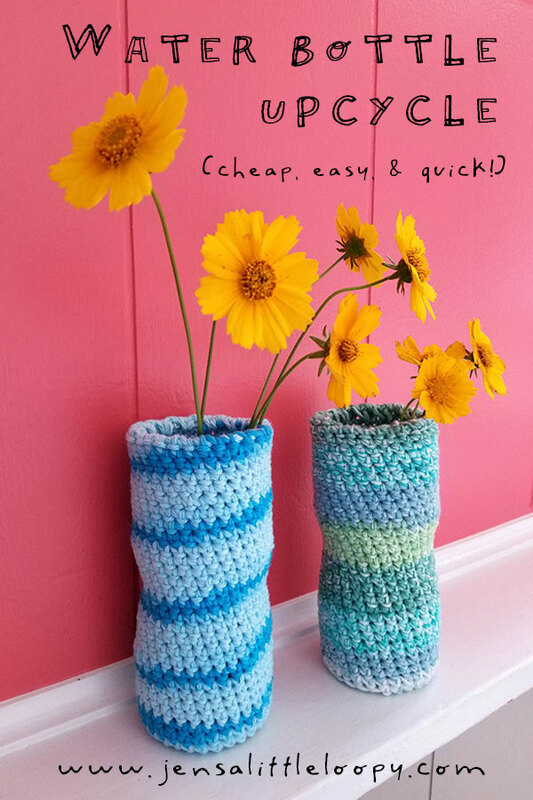 When I woke up yesterday, the idea of turning plastic water bottles into crochet vases popped into my head. 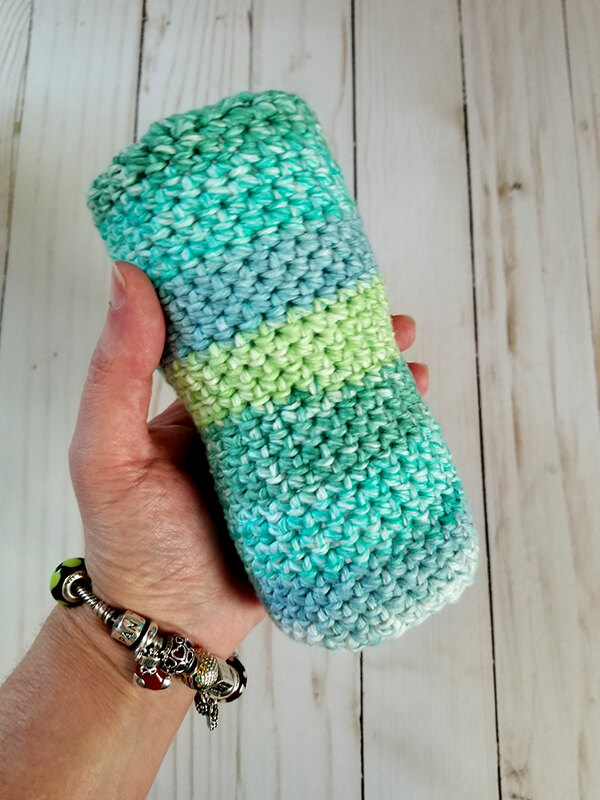 Before I even had my first cup of coffee, I had a crochet hook and a water bottle in my hand. 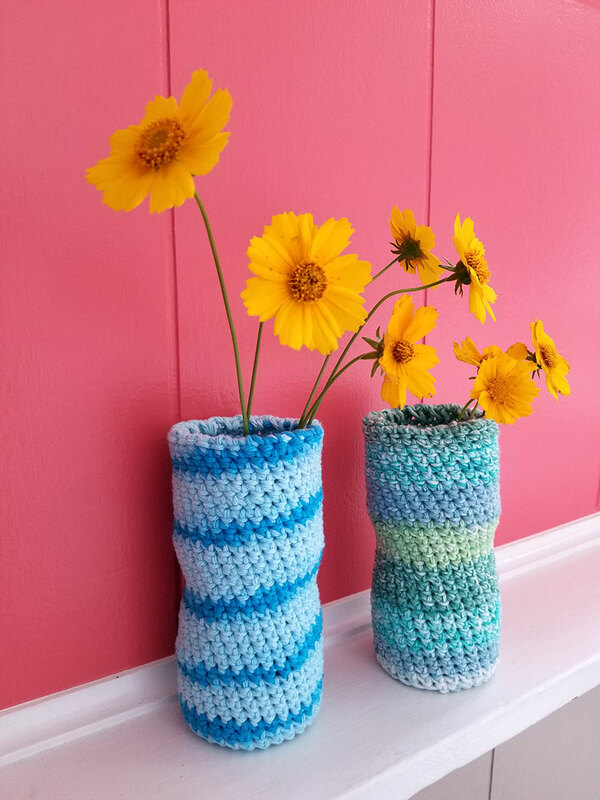 Crochet vases aren’t new, but they’re usually crocheted from the bottom up around a glass jar. Lovely way to keep glass out of the waste cycle! But summer is in full swing here in the US so that means we’re all hydrating and sometimes grabbing a bottle on the go when our reusable water bottles are empty. All those empty bottles add up to very full recycling bins! So for this project, I flipped the script. 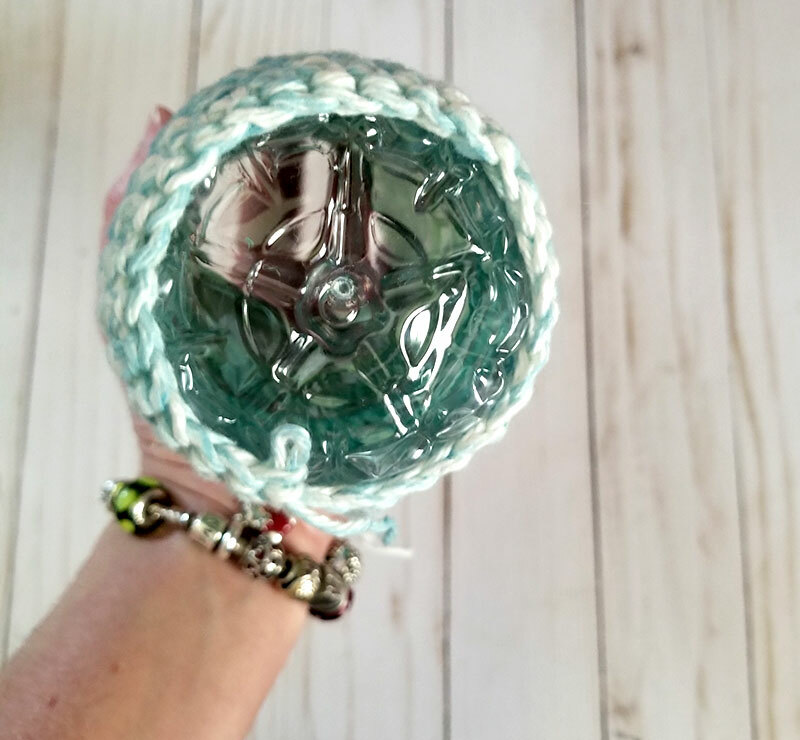 To avoid having sharp edges at the top of the vase, you’re going to punch holes in the top of your water bottle, crochet through those holes, and make a cover for the bottle that is attached and folded over the sharp edge of the bottle. For this project you’ll need just a few things that you already have around the house. It makes up in an hour so you could make a lovely collection of upcycled vases in one crafternoon! Be sure to share this with your treehugging friends! One ball of cotton worsted weight yarn – Lily Sugar and Cream is my go-to kitchen cotton. I used just about half of a ball. 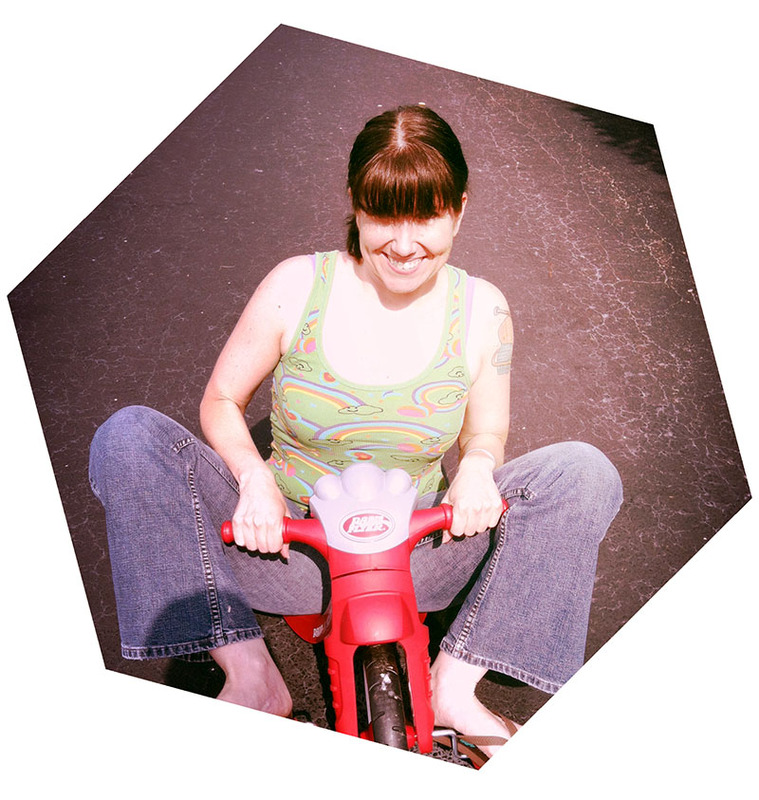 Here’s a handy list of my product recommendations on Amazon! 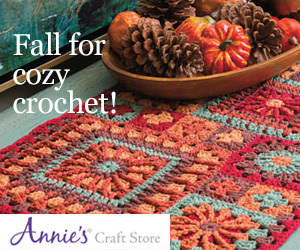 Notes: This pattern uses US crochet terms and is worked in continuous rounds from the top down. If you have a little Sharpie left behind after making that cut, you can wipe it off with a cotton ball and a little rubbing alcohol. Now we’re going to get ready to punch the holes around the open end of the bottle. 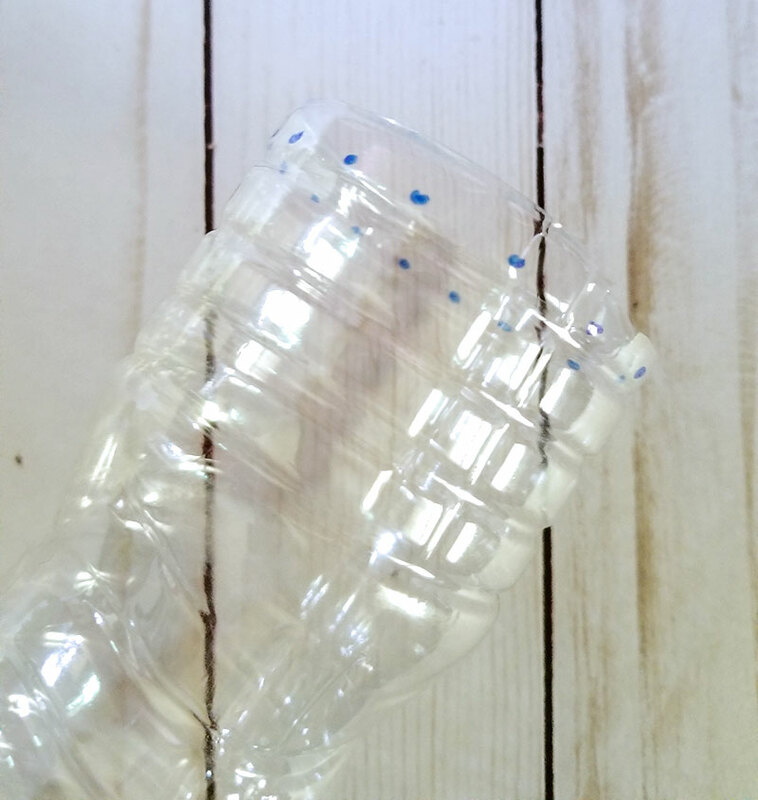 Grab your Sharpie and make little evenly spaced dots around the top of your water bottle, about half an inch apart. You don’t have to be super precise about it because you’re not going to see the holes when you’re done. After you make the dots, use your hole punch to punch the holes. Be careful not to punch too close to the edge! If you do get too close to the edge and the bottle splits, no worries. Just place some tape over both sides of the hole and punch the hole again, but a little lower. I don’t know if you can see the holes in the photo but I promise they’re there! Grab your yarn and hook. 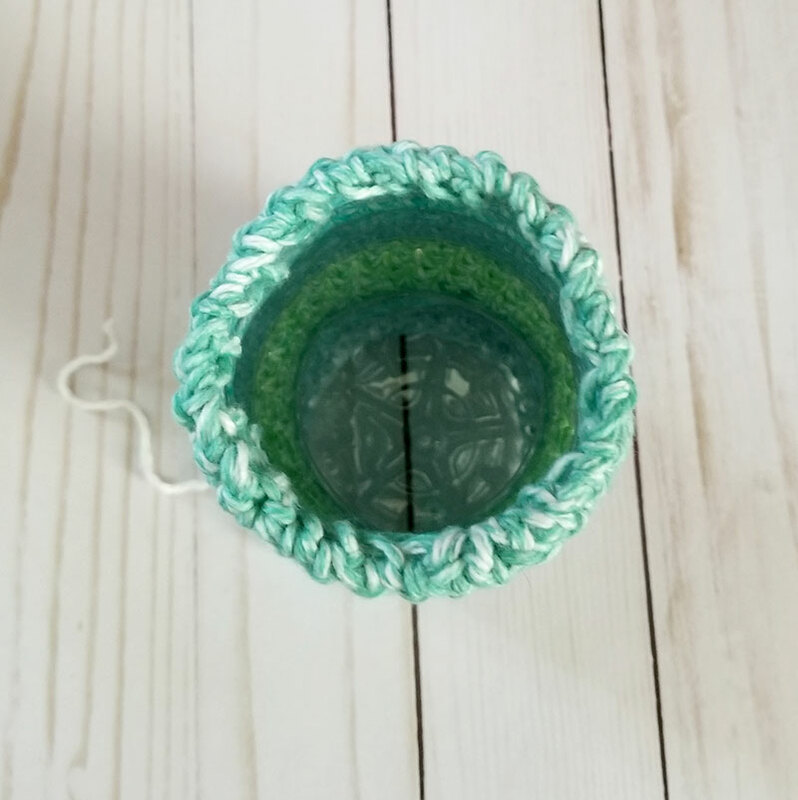 Insert your hook through one of the holes, pull your yarn through, and make one sc. Then make another sc. Continue around the top of the bottle making one sc through the hole and one sc after that stitch until you get back to your starting point. You may wish to crochet your beginning tail under the first row, but you could also leave it loose and weave it in at the end. Either way works. 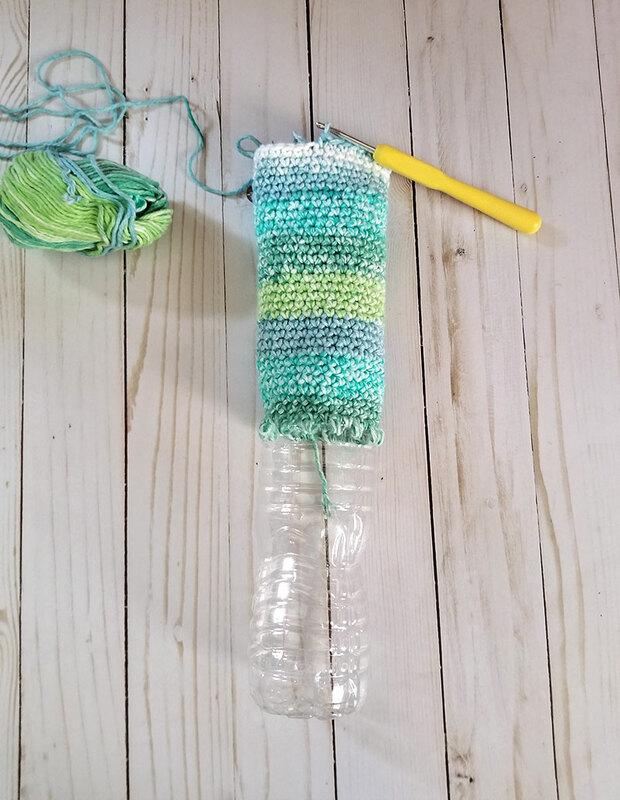 Try not to crochet too tightly, or the yarn won’t easily fold over the bottle at the end. The first row can be a little fiddly, but after that I promise it’s smooth sailing! 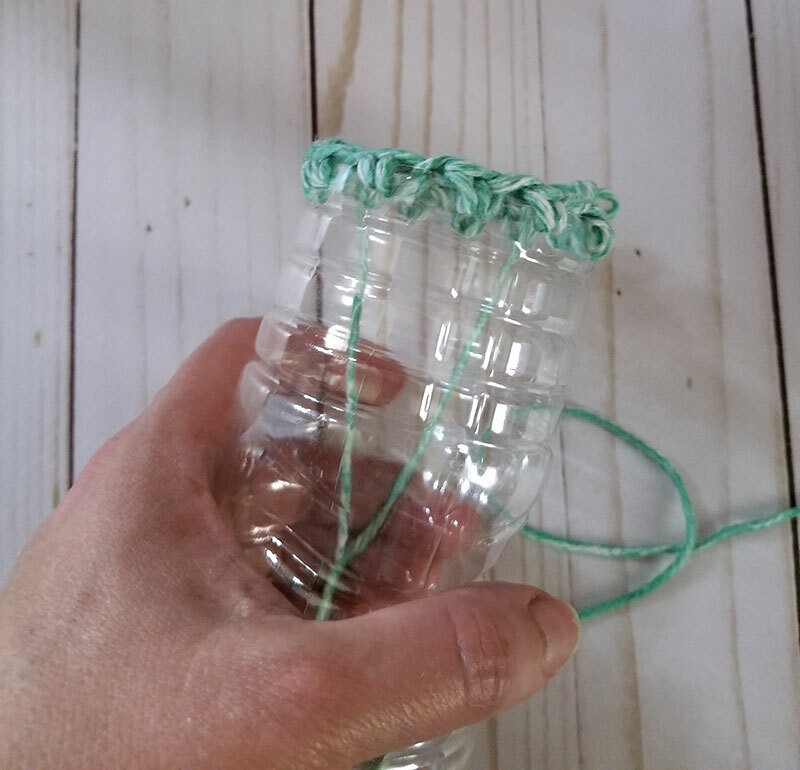 Turn the crochet inside-out over the water bottle to cover it. 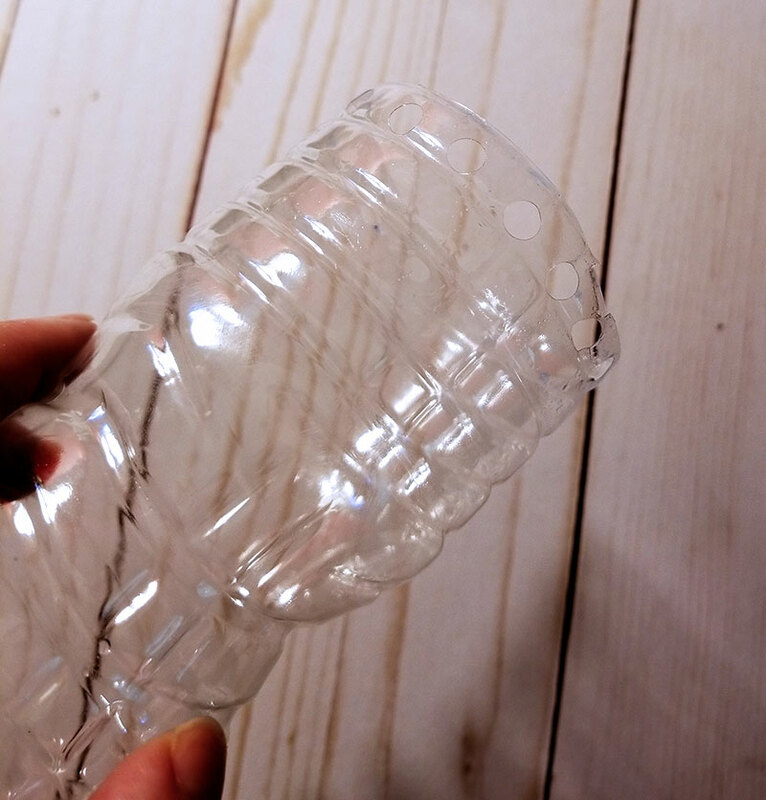 This part can be a little tricky because most water bottles are made of thin plastic and it tends to crinkle. After you get the crochet folded over, check the length and pull out any extra stitches if necessary. You want the bottom of the bottle to rest flat. You may need to reach into the bottle and press out bumps and wrinkles created when you turned the work so that the surface is smooth again. 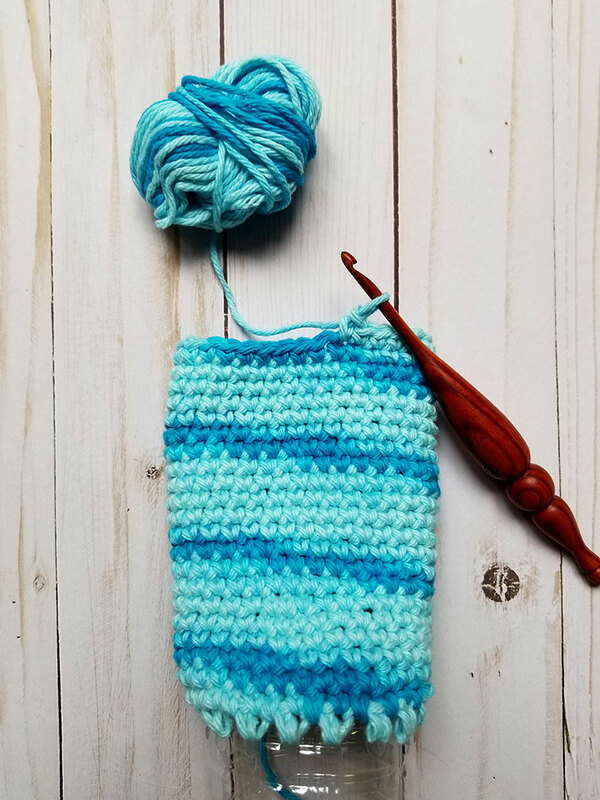 Use the blunt end of a crochet hook for any spots you have trouble reaching. Weave in your yarn ends, add water and flowers, and enjoy your handiwork! Plot twist! This project is a blank slate! There are so many ways you can take this idea and make it your own. Tag me on Insta @jensalittleloopy and show me what you come up with! 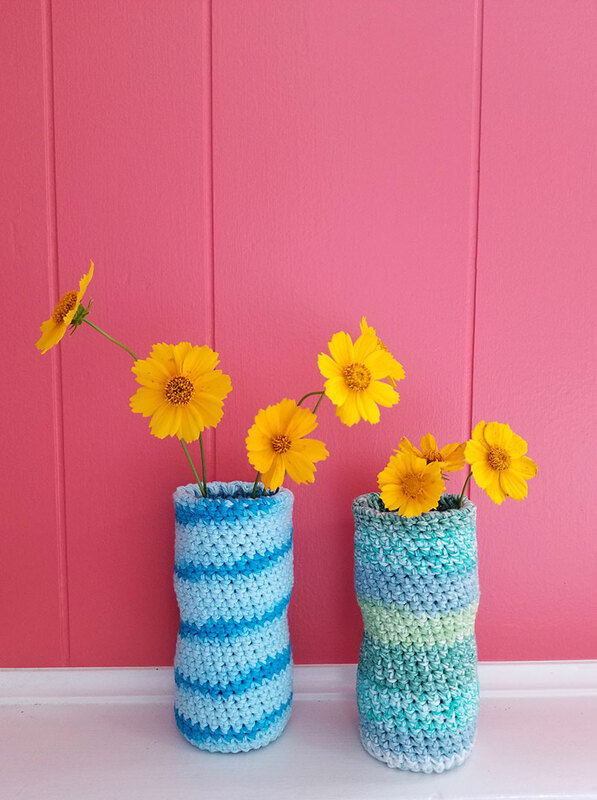 You can make shorter vases by cutting off more of the top of the bottle, measuring what’s left, and following the pattern until your crochet is the right length. You don’t have to use cotton yarn – stashbust some leftover wool, use fun fur, dye some yarn – whatever your heart desires! 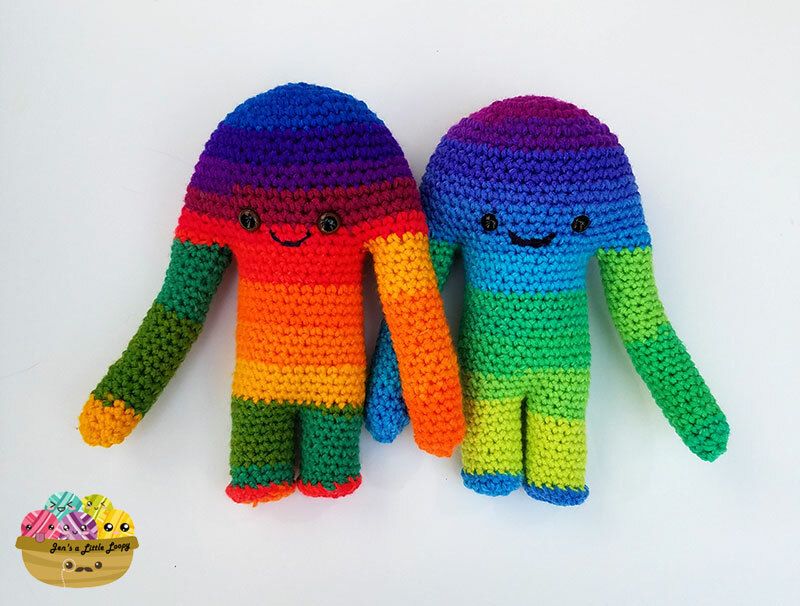 Pick a couple of yarn colors and make stripes or color blocks. 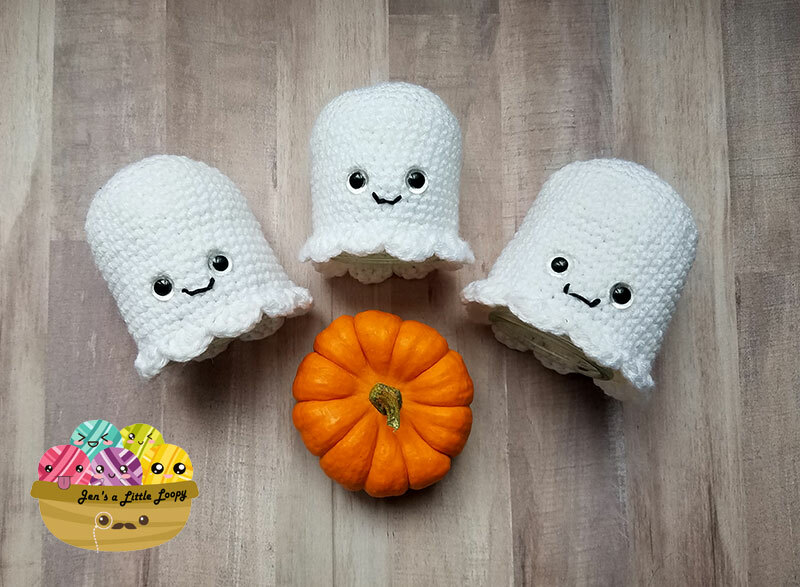 Add a cute face! 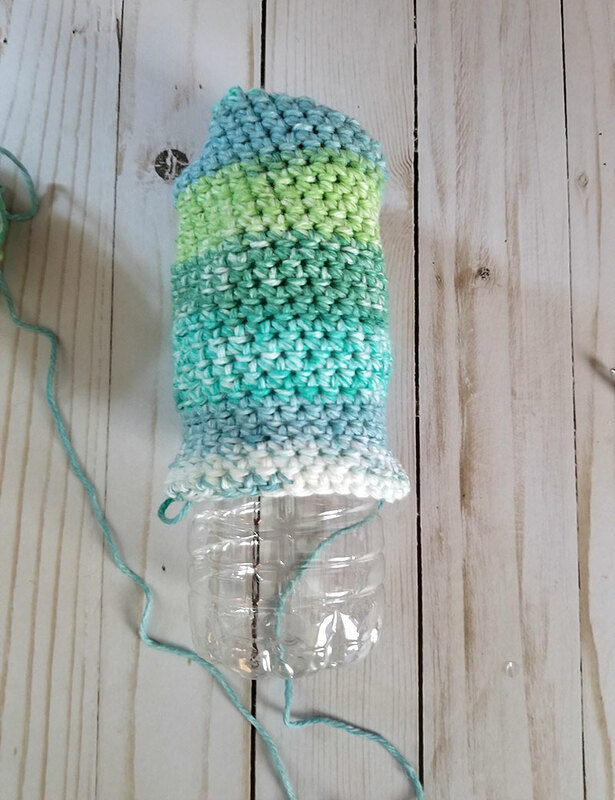 If you do this, just remember your face needs to be added to the wrong side of the crochet because you’re going to turn the crochet inside out to cover the bottle. 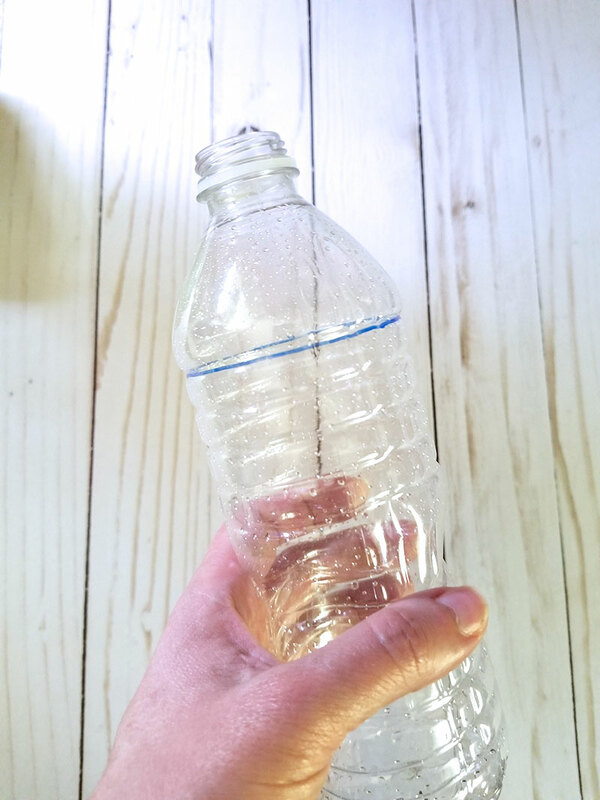 Make a giant vase by cutting the top of a 2-liter soda bottle off. I’m definitely going to be trying this. Make a tiny succulent planter by cutting most of the bottle away. Add some small rocks in the bottom for drainage and pop in an adorable baby plant. 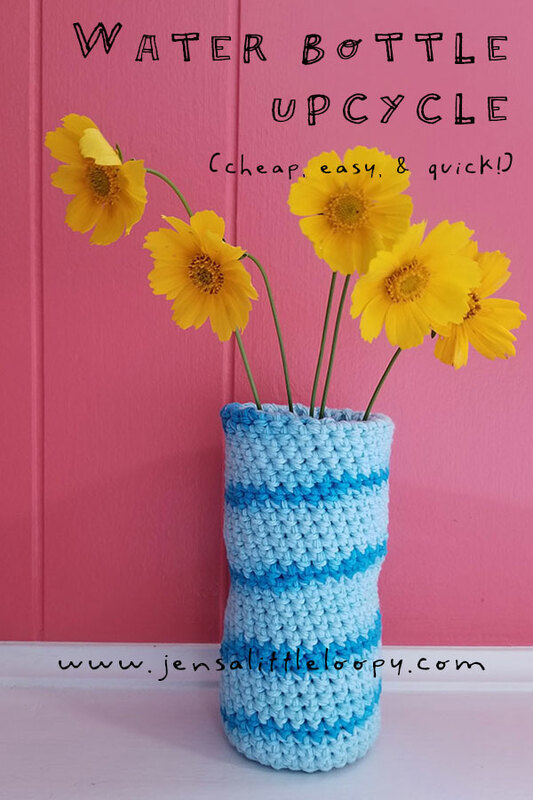 Crochet a fancy edge or stitch some beads around the top of your vase. 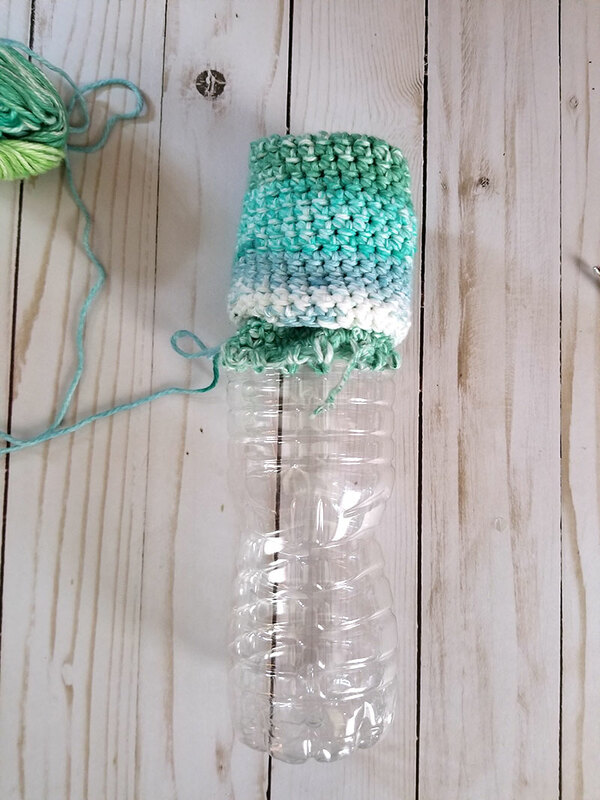 If you’re into upcycled crochet projects, you’ll love this easy way to turn t-shirts into yarn and make a rug! I made the rug in the post a couple of years ago and finally found a home for it in my craft room! If you liked this project, I’d love it if you pinned and shared it!